Adriel Tjokrosaputro, a fifth semester Music Business student interning with Warner Music in Indonesia, shares his thoughts about the importance of corporate culture when considering an internship. “You three! Go to the pantry right now!” My supervisor shouted at me and the other two interns military-style. Yet, we silently ran and smiled. Three minutes later, we walked out carefully. My fellow intern, Aji, had a fancy chocolate cake on his hand with 20 lighted rainbow candles. 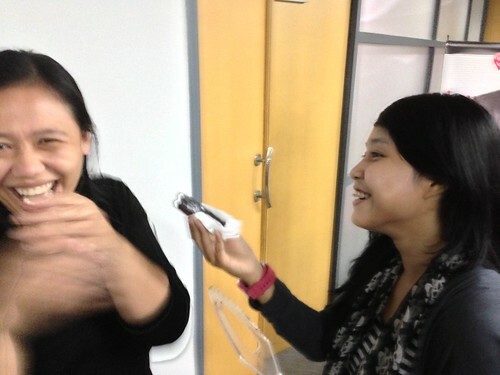 Ten steps later, Warner Music Indonesia exploded into the song “Happy Birthday Dear Anggi.” Following Indonesian tradition, the birthday girl was given the opportunity to give the first piece to her most beloved co-worker.Turned out the person was my supervisor, Ms. Linda. She laughed and cried. In the first week, I assisted mainly the Marketing Department with administrative tasks, including re-organizing and cataloging tracks and artworks for 11 local artists held under WMI. Even with 45 hours of internship/week, I was not able to finish the work until the very last hour on Friday. Since Wednesday, I had decided to work on the project at home as well, approximately 2 hours/night. On Friday, I submitted everything for review to my supervisor and she was really pleased. “Wah! Cepet banget!” she said, which means, “Wow! That’s quick!” in Indonesian. As a minor project, my supervisor also asked me to make promotional materials for a new music video of a new single by a local band. For this particular project, I worked with the other 3 interns that are currently interning at the company. It is very nice that my supervisor gave me a group project, as this is a great opportunity to mingle with the other interns.